Netflix, on the other hand, has continued to flourish, with the world’s dominant streaming service adding nearly 30 million customers last year. It now has about 60 million subscribers just in the U.S.
One reason viewers are continuing to drop cable and satellite: they hate advertisements. 75 percent of Deloitte’s respondents said there are too many ads when they watch traditional TV. 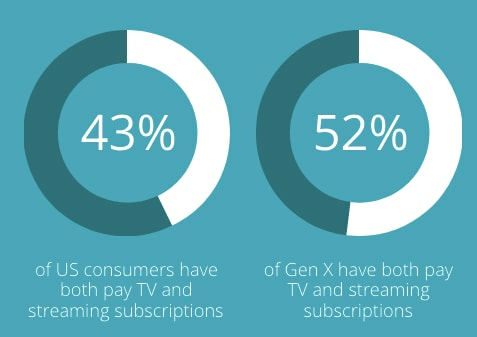 Still, the report shows streaming versus traditional TV isn’t necessarily an “either/or proposition,” at least right now for many viewers, with 43 percent of respondents paying for at least one streaming service and one pay-TV package. Binge watching, which Deloitte defines as watching four hours or more of content in a single sitting, continues to play a major role in streaming’s rise, with 37 percent of millennials saying they binge at least once per week. Another 40 percent of U.S. millennials said they stream at least one movie per day. Perhaps ironically, one red flag for streaming, according to the report, could be an increasingly crowded market. The more streaming services there are — and with more on the way from Apple and WarnerMedia — the more frustrating it will get for viewers to follow and pay for. “With more than 300 over the top video options in the U.S., coupled with multiple subscriptions and payments to track and justify, consumers may be entering a time of ‘subscription fatigue,’” said Kevin Westcott, vice chairman and U.S. Telecom and Media and Entertainment leader at Deloitte.